MARIETTA FOOD TOURS: The Marietta Square Food Tour takes you on a 3 hour guided tour of 7 locally owned and operated eateries. 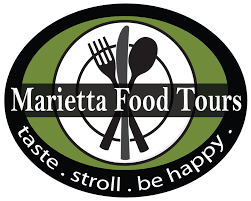 The walking tour allows you the unique ability to explore Marietta, all while gaining knowledge about its history, culture and architecture, at the same time savoring the appetizing culinary selections available on the bustling square. Every Saturday from 11am – 2pm. For more information, please visit www.mariettafoodtours.com.